Cause of her death was T.B. Katherine was born about a quarter before 10 o'clock in the evening November 27, 1850. Baptised December 27, 1850 at Richmond Old Church by Henry R Julius. Alfred A Julius, Miss Clifton, and Miss Julia Quilter sponsors. Ellen Hannah Julius stood proxy for Miss J. Quilter. Fenn - Julius : 12 inst., at West Molesey, by the Rev Churchill Julius, brother of the bride, assisted by the Rev G Nicholas vicar, Edward Liveing Fenn Esq., M.B. the Old Palace Richmond, Surrey, eldest son of the late T Harrold Fenn Nayland Suffolk, to Katherine Pauline, third daughter of F G Julius Esq., M.D. The Grove West Molesey Surrey. "I forgot to say that I saw Katie Julius now Mrs Fenn looking very well and happy; they dined with us at Annie Bateman's and I thought her husband a very pleasant and superior man. It seems so odd to see Katie mistrefs of her old home. Dr Julius came up to see me, and spent a few hours with us; he is not as well and strong as he used to be"
Edward, Mary, Arthur and I started a most jovial party at 6 pm en-route for Switzerland Ernest came to bid adieu at Charing Cross - Our first journey proved long and tedious, owing to the Bank Holiday and we only arrived at Folkestone in time for the boat 10 pm two hours late. The first hour on the sea was lovely by moonlight - but a fog came on when we were half across and we beat about for two hours before getting into the harbour, we went to the Hotel de Louise and got to bed at 3. Up again at nine when we had a long hot dusty journey to Paris, a nice dinner at the Palais Royale revived us, and we started at 8 pm on our long journey arriving at Geneva at 10.30 on Wednesday morning. We slept pretty well all night and enjoyed the view in the morning the scenery from Culoz along the banks of the Rhone was very beautiful. At Geneva we went to the Hotel du Lac, and after a wash and breakfast went in a steamer on the lake for three hours to a small town (Nyon) with an old tower and fortifications. After Table d'Hote we strolled out again round the town and had cafe in the street Ed and A smoking. Thursday, August 10 we started at 7 in the diligence (coach) for Chamonix gradually we ascended towards the mountains and the last half of the way was most beautiful with most lovely views of Mont Blanc especially from Sallanches where we made a halt at 1 pm for lunch it was a long hot drive and we reached Chamonix at 3.30, it is in a lovely valley, just under the Mont Blanc chain - a bath and table d'hote revived our party except myself who knocked up had a shivering fit, and was sent to bed with champagne. Friday, August 11 at half past 8 we set out for the Mer de Glace I had a mule who assisted Mary with his tail, passing through a pinewood to Montanvert we came on the glacier which we crossed with a guide, and much enjoyed walking on the ice and the fine air on the glacier, we then descended the rocks on the other side by the Mauvais Pas to the Chapeau where we lunched and the mule meeting us took me back to Chamonix After table d'hote E & I sat talking on the balcony with the two Miss Giles who arrived in evening from Lausanne. Saturday - the weather is still continuing warm and fine, we made another delightful excursion starting early we got over the zig zags on the lower part of the Flegere before the sun became powerful and a nice wood was then entered with numerous refreshing streams & after a three hours climb we reached the summit the view quite repaid the long walk Mont Blanc towering above all the Aiguilles the true monarch of the Alps which it scarcely appeared to be in the valley - after luncheon and a rest Ed & A crossed the ridge towards the Brevent and came home down part of that mountain - Mary & I sat in a lovely wood enjoying the views until 3 when we slowly strolled back taking short cuts and climbing rocks with the aid of our trusty Alpine stocks. The Giles came to our hotel & sat with us in the evening watching signals made from a party up Mont Blanc. Sunday, August 13 there is a pretty little English church at Chamonix where we went for Morning Service we saw Lady A Onslow there and had a few words with her coming out, after an early dinner we took a walk with the Giles half way up the Brevent it was a long walk and we did not reach home till after dark, we liked our companions very much. Ref: This unfinished account was written by Catherine in her Mr Punch's Pocket Book dated 1876. I ought to have written to you last week, for I am afraid you have lost my address, I am sorry I did not do so - Did you write home on Sunday - I hope you will write to me here as soon as you can - Poor Mother feels very lonely, in the grand big house, and very tired too, for I have, every morning to go into some very hot rooms, have a bath in one & sit for a long time in steam in another, I am so tired after it, that I can scarcely walk, and am very glad that there is a lift, to get upstairs to my bedroom again, where I have do go back to bed again. Bournemouth is a very beautiful place, I wish I could get out and see more of it, & go down to the sea but it rains nearly every day- it is pouring now - I have only once been to the sea, it is a long walk for me, but all through beautiful gardens, so pretty a stream runs through them for 2 miles with pretty little bridges crossing it - I have been out for two drives, in a health chair drawn by a pony, it rained each time, & the window had to be put up & I felt as if I was packed up in a box. I do hope my darling Wags that I shall really get better soon, & come home with enough to have really happy Christmas holiday with you all. Father tells me that Harry came home on Saturday quite well again. On the 15th April at 1 Portland Terrace Richmond Surrey KATHERINE PAULINE wife of EDWARD LIVEING FENN Esq. M.D. Aged 35. Death of Mrs Fenn : With great regret we have to report the death of Mrs Fenn the wife of Dr E L Fenn, which took place on Thursday at no 1 Portland-place Richmond at the early age of 35. The deceased lady was the third daughter of Dr Frederick G Julius, who died in the early part of the present year. She was married to Dr Fenn in 1872 and has left a family of five sons. Her death has occurred after a long illness from chronic inflammation of the lungs. Dr Fenn and his family may be assured that they have the sincere sympathy of very many residents in Richmond and its neighbourhood. Extract from a letter by Dr E L Fenn to their son Van on his Ordination. Upon Katherine's death her sister Mary Caroline Julius (Aunt Polly) looked after the Fenn children. Portrait of Katherine in Possession of E L Fenn Auckland 1998. 5. Pictures: Katherine P Fenn: Richmond Green Surrey. 6. Pictures: Letter by Katherine Fenn & Diary. Richmond Green Surrey. Katharine married Dr Edward Liveing FENN M.D. [MRIN: 47], son of Dr Thomas Harrold FENN M.R.C.S. 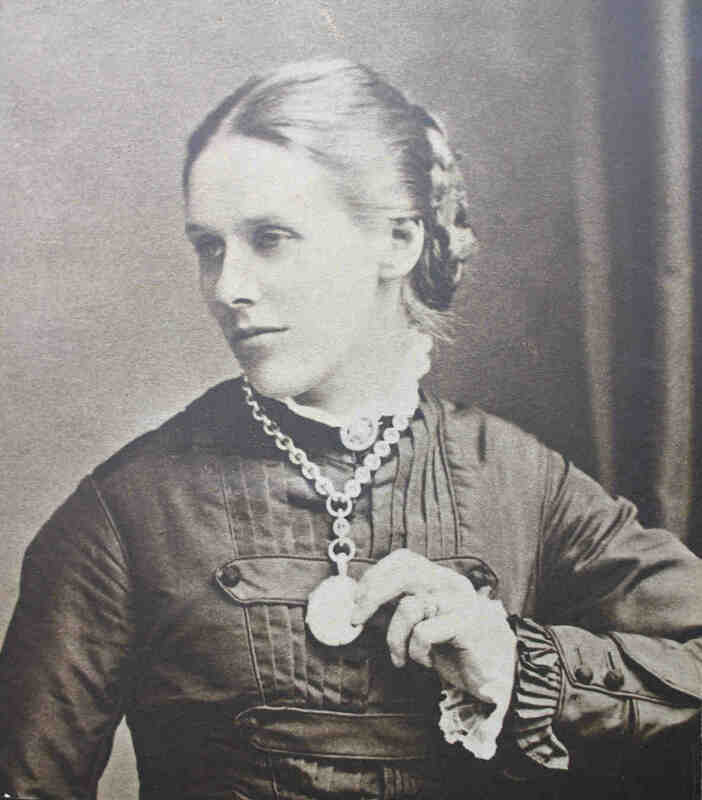 and Maria ALSTON , on 12 Nov 1872 in West Molesey SRY. (Dr Edward Liveing FENN M.D. was born on 20 Aug 1843 in Stourbank Nayland SFK, christened on 6 Oct 1843 in Nayland SFK, died on 8 Dec 1907 in Nayland SFK and was buried in Nayland Burial Ground.). The cause of his death was heart failure.